I remember being in my early 20s and wanting to photograph images of the stars, and having these ideas of images with a night sky in them. Sure, there were some images out there of star trails, it’s where my ideas originated...but actually achieving the effect was beyond my realm of knowledge. I remember we tried it once. We put film in the camera, set our aperture, and then locked open the bulb release, and left it all night. There were star trails, but the image was BORING as can be. Never in my wildest dreams would I have thought we would be where we are today with technology for photographing night skies. 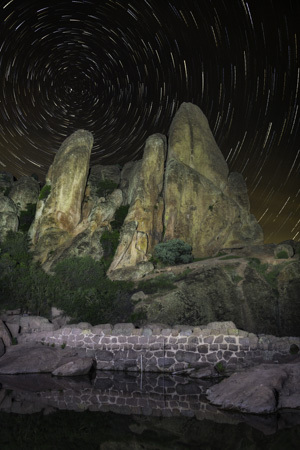 Aron Cooperman and I met a group of 5 eager photographers for a fun night of shooting the stars in Pinnacles NP. After a brief orientation in our San Jose gallery, we loaded up in the Aperture Academy van and set off for the park. This time of year is awesome, all the hillsides and farmland are green from the winter rains, and everything looks amazing. 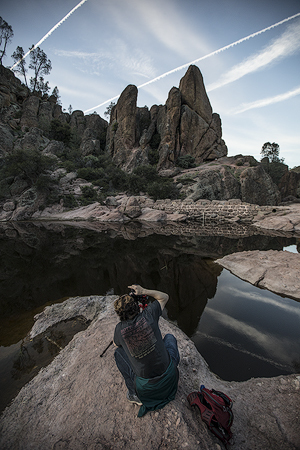 Pinnacles NP is one of the newest parks in the NPS, and it’s easy to see why once we arrive. It’s like someone took the rocks from Joshua Tree, and put in a forest instead of a desert. It’s awesome. 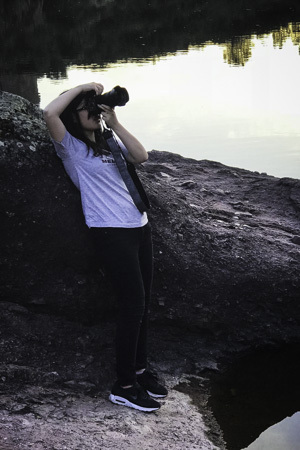 Our short hike from the parking lot to the reservoir where we shoot takes us up into these rocks, where we get a birds eye view of the valleys below. It’s a breathtaking image. There’s also a couple caves we get to traverse on our way to the shooting location. Once on scene Aron and I encourage everyone to find their composition. Part of the process of getting really nice star images is finding that composition, and working with the pre-planning so that you’re not trying to do it when it’s dark. 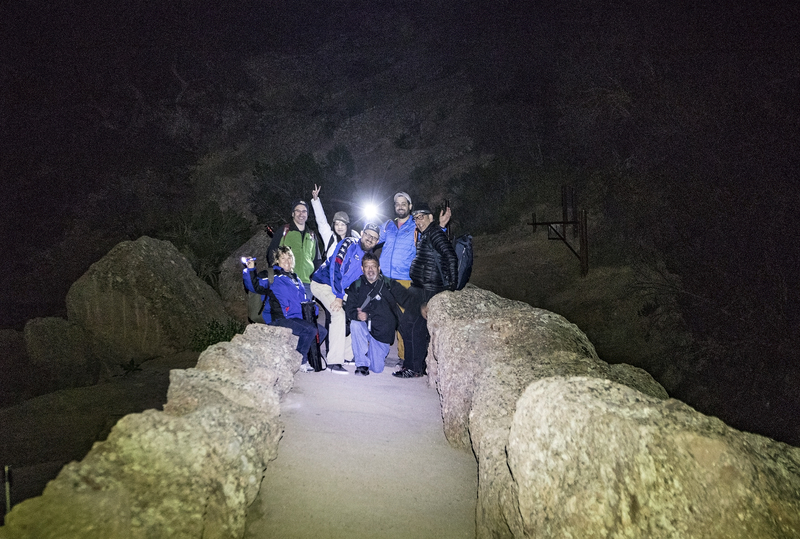 Focusing is the most difficult part in the dark, so we like to have everyone get set up, and focused when it’s light...you can also check where ‘sharp’ is on the lens, so if you happen to fall out of focus during the night, you simply have to visually align the lens again. Once the light has faded and the stars are out we begin with some 20-second exposures to capture ‘pin-point’ stars. 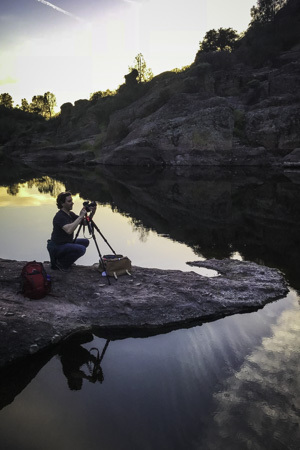 I use a flashlight to light-paint the scene and create a nice balance between the sky and foreground. Light-painting is awesome, but it’s a process...and no two scenes will have the same technique, it’s best to experiment a little with how long you paint, how bright the light is you use, etc. Once you get it dialed in, then you can shoot at will. We shoot pin points for a few minutes while we wait for the last bit of glow to fall away from the horizon. Then it’s time to set up for our star trails. These images require longer exposures, and a little bit higher aperture as well...but the nice thing is we can lower our ISO some too (in this case we went from 1600 to 640) this process requires us to shoot a series of 5 minute exposures with no time in between. Each exposure will have the stars ‘moving’ a tiny bit as the earth spins. When we combine them all together the next day, it will give the appearance of trails in the sky....a lot of fun! An hour passes, and our trails are collected, we fire off a few more pin point stars, and then start the fun hike out, and long drive back to San Jose. The next morning we all meet back bright and *(too) early for a morning of processing the images from the night before. Aron set up on the big screen projector and walked everyone through the process of moving the images from Lightroom into Photoshop, and creating the desired effects. There’s a lot to learn when it comes to using these programs, and applying personalized touches to the images...but the actual creation of the star trails is about one of the easiest things you can do. It was fun to see how everyone had slightly different takes on this scene. 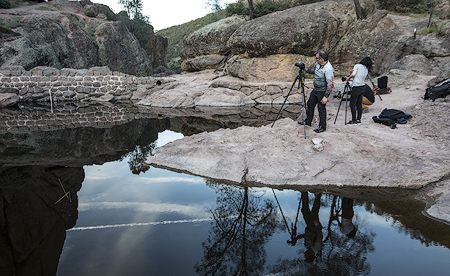 Once the mystery of “HOW” to do it was covered, the fun really begins as these photographers take the skills and go back out and start to amass a collection of their own adventures and star shooting. Thanks for a fun evening and morning!